What sounds like a great lunch to you? A burger and some fries with ketchup on the side or would you hold the burger and fries and just devour a heap of the tasty red condiment? If 50 packets of ketchup sounds like the perfect meal to you, then it's safe to say that you're infatuated by Heinz's scrumptious creation. If you really think about it, ketchup is a tomato smoothie so you're going to have a very healthy lunch! Props to you for being so health-conscious while simultaneously filling your belly with the yummyness that you desire! People may give you a strange look while you voraciously eat your mound of ketchup, but who cares, let them look! They don't need to understand your love for ketchup. 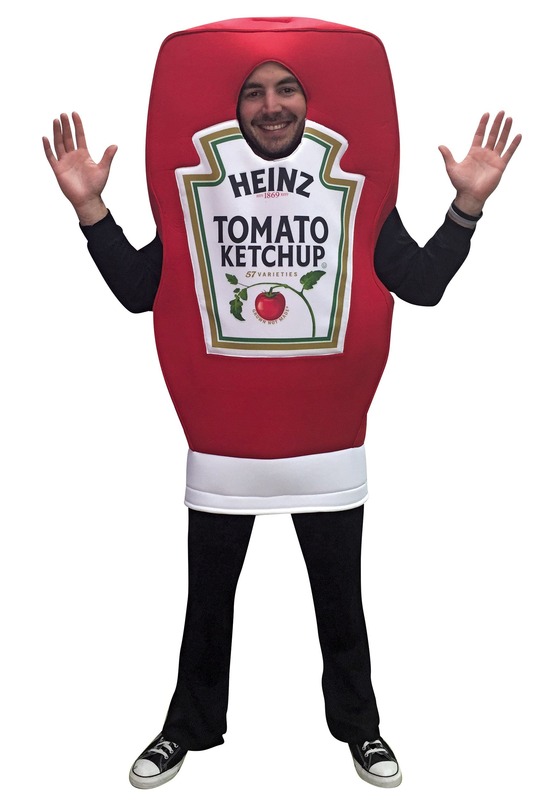 In fact, we want to support your quirky food preference and offer you this fantastic Heinz Ketchup Costume. Next time you sit down to devour a "tomato smoothie" wear this costume and you'll enjoy your meal even more than you could ever imagine! This Heinz Ketchup costume is a comfortable costume that you could wear just about anywhere. Wear it to a diner, a fast food restaurant, a fair, or any other place that you'd suspect to feast upon large amounts of the tasty, gooey, red treat. Just put the foam tunic on over your head, pop your arms and legs through the appropriate holes, and pop your smiling face through the circular hole in the front of the costume and you now look like a bottle of your favorite condiment. This costume is designed to look like an extra large bottle of Heinz Ketchup so no one will have to ask, "what are you suppose to be?" Plus, everyone will notice the jumbo ketchup bottle out on the dance floor busting a movie. Basically this costume is the best purchase you could ever make in a lifetime. You're welcome!